The word parterre means ‘low to the ground’ and it is in France at the Palace of Versailles that this gardening style perhaps became most famous. These gardens are very formal in structure with garden beds being geometrically designed and being defined by low clipped hedges with gravel paths between. Some parterre gardens are edged by stone, however box hedging is the usual choice. 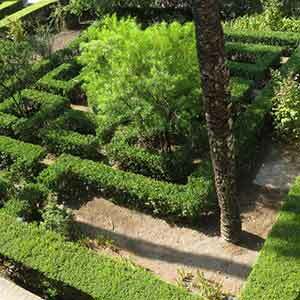 ‘Knot gardens’ with their woven pattern of paths are perhaps the ultimate, however they are time consuming to maintain. Often included are topiary shapes, statues, fountains and pedestals, and remember that it is the pattern of the garden, often viewed from a terrace that is important, many gardens in this style feature only the low hedging, gravel paths, topiary shapes and a central feature such as fountain. The concept of a parterre garden layout is now often transferred to a smaller design, herb gardens and vegetable gardens are a bit of favourite at present. John Gerard ‘noted english herbalist’ was in favour of using herbs as borders rather than box which he seemed to find ‘not to his taste’ . 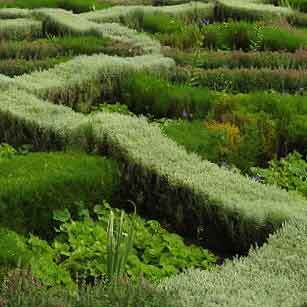 Rosemary, lavender, thyme and many other herbs are used as substitutes for the traditional box hedging, however it is the the box hedged borders that we see in parterre gardens that have made them famous over the centuries. Parterre garden furniture was not a big part of original designs, however seats placed in strategic positions allowed visitors to larger gardens to find a place to rest and admire the garden. Lawns surrounded by low hedging are now included in the designs used even in smaller spaces, with the low hedging used to divide the garden area into compartments. Villa La Gamberaia – A fascinating ‘Water Parterre’ that uses geometric ‘pools’ as an integral part of the design.